If you're planning a camping trip in Kentucky, you're sure to be pleased with the wide variety of Kentucky RV campsites available throughout the state. Whether you plan to tour Kentucky's many caves, visit horse country, or spend time on or near the numerous lakes and rivers, you'll be able to find a perfect camping spot. Outdoor recreation is very popular within Kentucky, and there are many lodging options for short and long term RV travelers. A few of the numerous RV campgrounds in Kentucky are detailed below. The Louisville South KOA in Shepherdsville is located just a few miles from downtown Louisville on the banks of Kentucky's Salt River. 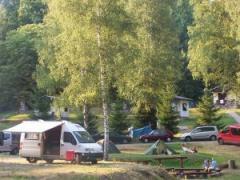 Full hookup RV sites are available, as are tent sites and camping cabins. This southern Kentucky campground is a perfect base for visiting Churchill Downs, Six Flags Kentucky Kingdom, the Jim Beam Distillery, and numerous other venues. The Dale Hollow Lake State Park Resort is located on the heavily forested southern border of Kentucky. It features 145 campsites designed to accommodate recreational vehicles of all sizes. Several campsites are set aside for those traveling with horses. The resort is also home to a lodge and full meeting facilities. RVers who choose to camp at Falls Campground in Fallsburg, KY will enjoy the scenic beauty of the falls for which the site is named. The facility features more than 60 RV campsites with full hookups, many of which have stunning views of the beautiful falls tumbling over sandstone rock formations. The facility also has five camping cabins and an efficiency apartment for travelers who don't have their own recreational vehicles. The Renfro Valley KOA campground is located in Mount Vernon, KY, just off I-75. 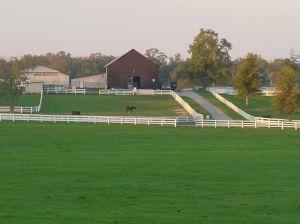 It sits in the Renfro Valley and is surrounded by the scenic hills for which Kentucky is famous. You can select from among more than 100 shaded and open field Kentucky RV campsites.The campground is less than a mile away from the Kentucky Music Hall of Fame and Museum. It is also located in the vicinity of Cumberland Gap National Park, the Colonel Harland Sanders Café and Museum, and the Rockcastle County Historical Cabins and Craft Village, and many other attractions. Otter Creek Park Campground sits just south of Louisville, KY in Mead County. The park has a total of 250 Kentucky RV campsites on the grounds of a 2,600 acre park, 150 of which are outfitted with full hookups. The park also has a number of single family and group cabins. These are just a few of the many wonderful campgrounds located throughout the state of Kentucky. Information about additional campsites is available from the Kentucky Department of Tourism. No matter where you end up camping in the Bluegrass State, you're sure to make memories that will last a lifetime.